Sisters Molli and Devyn, along with teammates Roman and Kyo-and a stockpile of cutting edge, cyber-punk technology, form a confident team of mercenary thieves able to take on the most formidable jobs around. Yet, when one cyber heist turns out to be more than they bargained for, as a mysterious package and its contents threaten to unravel the group to its core, the menacing worlds of corrupt industry and deadly espionage is unleashed upon them! Join creator and writer Mark Roslan (Broken Pieces), penciler Mike Bowden (World of Warcraft), and colorist David Curiel (Avenging Spider-Man) for this hit sci-fi, action adventure series! 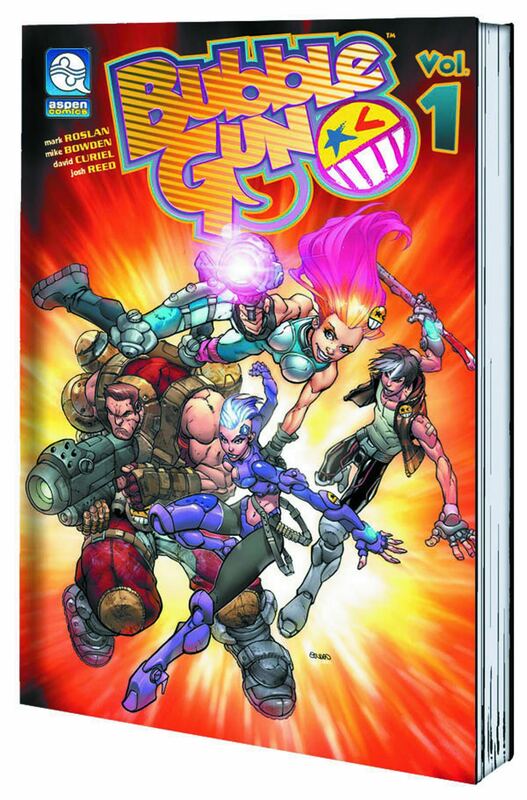 Collecting together the sold out first volume and featuring an extensive cover gallery, this BubbleGun volume 1 TPB is a must have for any fan!